Few interior renovations offer as substantial a change to the look and feel of your indoor environment as augmenting your space with new carpet. 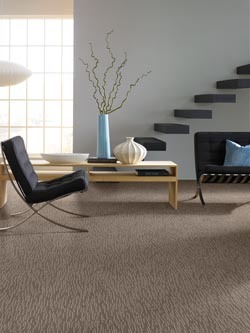 Carpet adds an exceptional visual and physical warmth to any indoor space. Favoured by home and business owners around the world, carpet complements nearly any aesthetic, reduces ambient noise, and offers a soft cushion underfoot, making it an ideal choice for areas that endure a great deal of foot traffic. Enjoy the comforting feeling of carpeting under your feet when you choose from our impressive selection of premium flooring at Steinbach’s Flooring Canada. At our carpet showroom in Steinbach, MB, we proudly offer a wide range of flooring options from a handful of the industry’s top manufacturers. When you’re ready to update the flooring in your home or office, turn to our experienced specialists for custom carpet installations that are sure to bring your design visions to life. When you visit our expansive showroom, you’ll find an impressive collection of flooring materials that will transform your space from ordinary to extraordinary. Featuring top-quality bedroom and living room carpet, you are sure to find an ideal flooring choice that’s sure to satisfy. With so many choices available to you, finding a choice that perfectly suits your aesthetic preferences and practical needs might be more difficult than you first anticipated. Our keen flooring specialists understand that every space is as unique as those who call it home. That’s why, at our carpet showroom, we take an individualized approach to all of our customer’s needs to ensure their new flooring is the right choice for their space. With industry-leading selections featured at competitive prices, our customers are sure to find the perfect option for their commercial or residential space. With regular cleaning, our carpeting will hold up strong to years of use without the need for extensive repairs. Ensuring your new flooring solution offers enduring beauty and performance starts with custom carpet installations from our skilled professionals. We’ll make sure every inch of your new flooring solution is placed perfectly. As part of our comprehensive flooring service, we also offer carpet replacement to help you get the most out of your floors. When we finish, you’ll be left with a new surface underfoot that will continue to serve you well throughout the years. Contact our specialists to learn more about the premium carpet flooring selections we have on offer. We proudly serve customers in Steinbach and Winnipeg, Manitoba, as well as the surrounding areas.